The Automotive Industry Development Centre (AIDC) and Japan International Cooperation Agency (JICA) have collaborated on a programme to dispatch automotive experts from Japan to South Africa, to provide technical expertise and training to develop local automotive manufacturing companies. A Memorandum of Collaboration (MoC) was signed by both organisations to highlight their commitment to growing local automotive manufacturing companies to become globally competitive. The AIDC has vast experience in Supplier and Enterprise Development programmes, and has been working closely with JICA to develop and implement programmes addressing the needs of the local manufacturing industry. During the pre-planning phase of the programme during the second quarter of 2015, four companies were identified by the Japanese experts, Kazunori Hayashi and Michiharu Suzuki, to participate in the initial training. Both Hayashi and Suzuki come with decades of experience in Kaizen best practices at renowned automotive plants in Japan. JICA takes full responsibility for dispatching of the experts from Japan whilst the AIDC will host them in South Africa. The participating companies – Allite Excalibur, Feltex Trim Rosslyn, Feltex Trim Durban and Duys Component Manufacturers – will benefit from improved business efficiency and productivity, lean manufacturing techniques, enhanced use of technology, and improved quality of products, amongst others. Speaking at the launch ceremony, Renai Moothilal, Director: Automotive at the dti, explained that the automotive sector is a key focus point in SA’s long term industrial objectives. “It is no surprise then that the sector specific programme of support to grow automotive manufacturing in SA, the APDP is one of the dti’s flagship industrial development incentive packages,” Moothilal explained. “We thank the Japanese government for being active in supporting these policy development measures,” he added. JICA’s Hiroyuki Kinomoto, Chief Representative for JICA, explained that the global automotive industry has a growing need for quality parts that are produced efficiently, hence JICA was privileged to provide technical assistance to the AIDC to achieve world-class automotive industry global competitiveness in SA. “JICA is assisting the AIDC to enhance the development of its human capital expertise to accelerate competitiveness of the industry,” he said. “Our mandate is to accelerate economic development to improve competitiveness of local industries, and by strengthening the AIDC’s capacity to nurture continuous improvement, they will then be able to emulate this training to assist automotive suppliers to improve their global competitiveness,” Konimoto added. 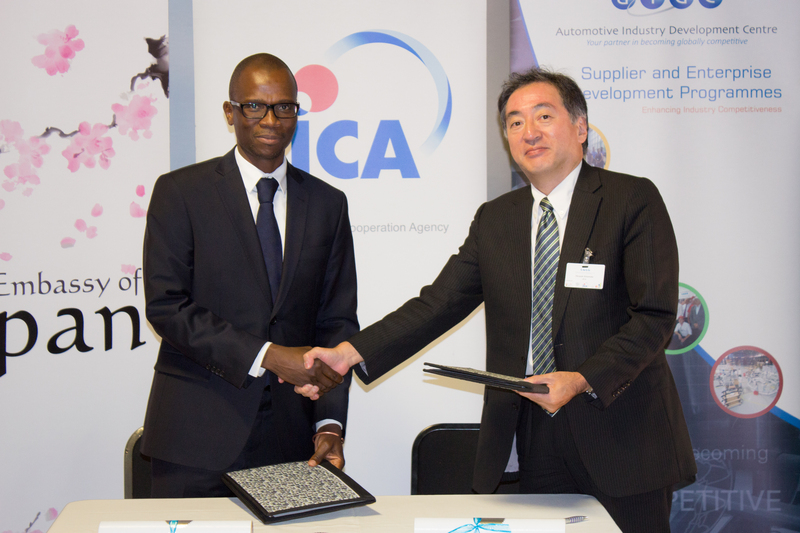 AIDC CEO, Dr. David Masondo, said that the AIDC was privileged to collaborate with JICA on an automotive programme that can only benefit local manufacturing firms. “The AIDC wants to make an impact, and with the support of JICA and the Japanese government, we can only improve the global competitiveness of our participating companies,” said Masondo. “The AIDC and JICA share the same objectives and we believe that we can ensure better KAIZEN practices at our local manufacturing plants,” he added. Nkumbuzi Ben-Mazwi, Department Manager: Supplier and Enterprise Development at the AIDC, expressed his eagerness to the collaboration which should result in socio-economic impact that exceeds the expectations of all parties. As part of the collaboration agreement, the JICA experts will transfer skills and knowledge to five AIDC project managers, Hlulani Mahlaule, Mlondi Chiya, Jan Muller, Sydney Theko and Dianne Jogessar, to ensure sustainability of the programmes, post implementation. The signing of the MoC has effectively established a symbiotic relationship between the two organisations and will increase both organisation’s mandate to ensure continuous improvement and increasing the global competitiveness of automotive component manufacturing plants in South Africa.